PTMSC Blog : Rock, Paper... Skeleton? Over the last couple of weeks many of you may have noticed a life size paper orca skeleton on the wall of Natural History Exhibit classroom. Where did it come from? Why is it here? 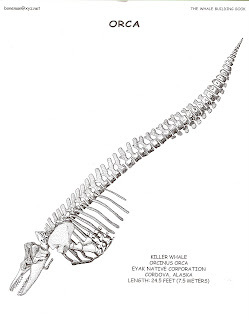 Are we still working with the bones from the real killer whale? The idea came from the creative mind of Libby Palmer, the skeleton drawing from The Whale Building Book by Lee Post, and tracing and cutting from the hands of a few skilled volunteers. 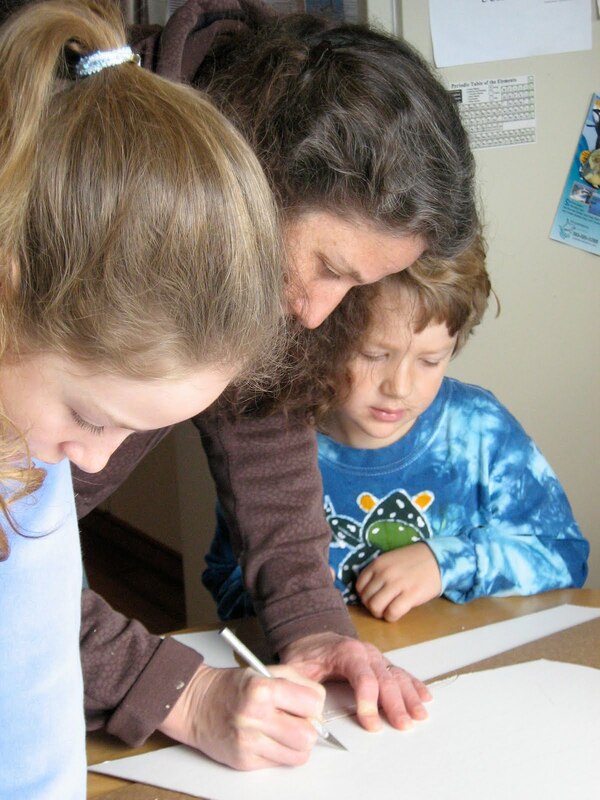 The first step was projecting a life size picture of Lee's drawing onto a wall in Libby's house. We took turns tracing the bones onto heavy duty white paper, and then used razor knives to cut the bones out. Hanging the paper skeleton was not an easy task, but after several brainstorming sessions our paper skeleton is now hanging! Our finished skeleton is 24 feet long (the real skeleton is approximately 22 feet). Do you have a mystery bone you found on the beach, in the woods or in some other location? Bring it in and learn from our bone experts what animal it may have come from. Even if you don't have bones to share it is a great opportunity to stop in and learn something new! Work with the real bones is moving right along. It has been great to have Lee Post , "The Bone Man", here all week to examine the bones and help brainstorm about our next steps. I'm glad he is so open and willing to share his knowledge with us. He has already shown and taught me a lot in his time here. Lee will be heading up the articulation when the bones are ready and the time has come to put this skeleton together. Funding for PTMSC's Orca Project comes from Institute for Museum and Library Services. Thanks to the Port Townsend Paper Company for donating the high-quality white-faced cardboard paper for our skeleton. 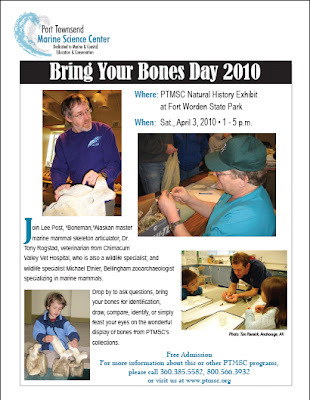 Hope to see you at Bone Day! Awesome! I can't wait to check it out at Bone Day! it is pretty impressive how they can determine the shape that it had with only its bones. Interesting, I'd like to know more about Libby Palmer, her ideas are an important element in this kind of Projects, specially if we are talking about education. Those experts can show up lots of ideas. This is a goos project actually I figure out that it should catch the children's attention so much, that's perfect in fact I wan to make it at home because it seems to be incredible.